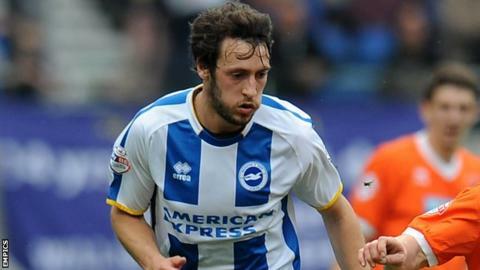 Brighton & Hove Albion winger Will Buckley hopes to end the season on a high after an injury-hit campaign. The 24-year-old, who has missed two months with hamstring trouble, has scored three goals in 30 appearances for the play-off chasing Seagulls. "Getting back to fitness is difficult sometimes. My form has not been there," he told BBC Sussex. "To have a good end to the season would make up for that. I'm sure I'll forget about my season if we end it well." Buckley scored eight goals for Brighton last term as the club reached the Championship play-off semi-finals. They are once again contenders for a play-off berth, as they currently trail sixth-placed Reading by one point with two games of the campaign remaining. Former Albion team-mates Dean Hammond and Ashley Barnes have already won promotion to the Premier League this season with Leicester and Burnley respectively, which Buckley says is spurring him and the rest of the Brighton squad on. "I am happy for them," the former Rochdale and Watford man said. "I spoke to Ash the other day and he deserves it as he has had a good season. You see players getting promoted - especially your mates - and it makes you want it a bit more. "Every player wants to play at the highest level and to do it at a club like this, which is preparing for that, would be unbelievable. "Every year goes by and it gets more frustrating that you get so close." Brighton host League One-bound Yeovil Town on Friday and a victory would see them leapfrog Reading, who travel to Doncaster on Saturday, and move into the play-off places. "This year we are there again so it is a good chance and we need to make sure we take it," Buckley said. "We have been trying not to look at other people's results for a few weeks now but we can put a bit more pressure on by getting a win on Friday. "If we win our last two we will give ourselves a good chance."